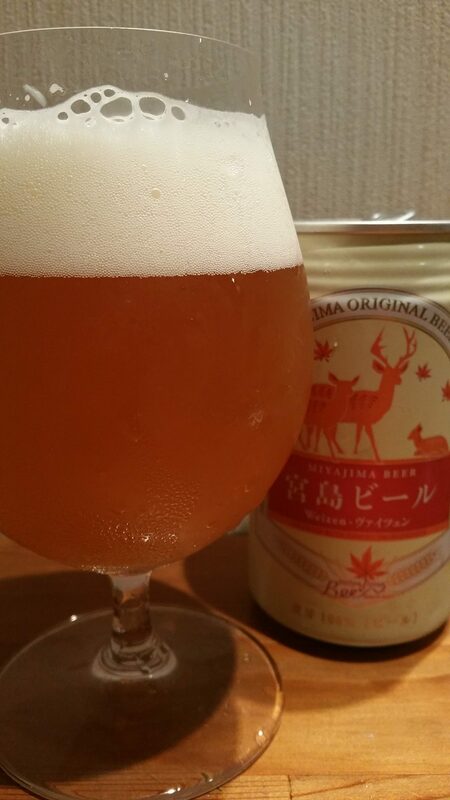 Miyajima Weizen is a 5% German hefeweizen from Miyajima Beer, based in Hiroshima, Japan. It’s part of their all-year round range of craft beer and can be found in cans, occasionally in bottles, and on tap at various places.A beer with little to no background behind it. The can was bereft of any further details besides the usual “malt, hops, and yeast” and the internet came up blank. An interesting flavour profile for a weizen. Miyajima Weizen poured out a deep hazy orange colour with a decent amount of fluffy white head on top. The aroma was distinctly weizen with wafts of banana and clove coming through with hints of wheat too. However, there was an unusual sourness to the beer – nothing overpowering, rather a niggling feeling at the back of the nose. The sourness was present in the body but it was a faint bitterness instead – perhaps too many hops had been used in the beer? Miyajima Weizen also had the typical weizen profile of bananas with some pepperiness going off in the background. There was also an underlying sweetness to it as well that mellowed out as it warmed up. A peculiar concoction of flavours going on really. The major let down of Miyajima Weizen for me was the body’s texture – it was a tad thin for me with all of these flavours going on. Miyajima Weizen isn’t a bad weizen by any means but with so much going on and the thin body, it’s hard to recommend it over other weizens out there.